A new pairing for us. 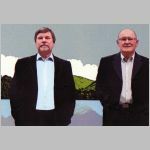 Nick and Ed hail from Lancashire and come together to bring us a selection of songs both ancient and modern. Their voices blend well together and Ed’s guitar playing completes the sound. Nick is a fine ballad singer in his own right so all in all we are in for a treat.